Amazon CEO Jeff Bezos is quoted as saying, “What’s dangerous is to not evolve.” His company has followed this mantra to the point where you can’t tell any more if Amazon is a retail, media, or tech company. Organizations must follow Bezos’ advice when it comes to evolving their digital analytics efforts or choose to live dangerously in an increasingly data-driven world. But you can’t evolve your digital analytics capability unless you clearly understand what you’re doing (or not doing) with your digital data. 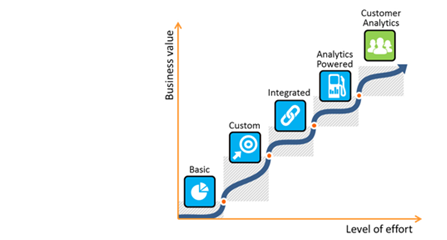 Having worked and interacted with many companies over the years, I’ve created a simplified framework or “analytics maturity model” identifying five essential milestones or inflection points in the digital analytics journey. Understanding these milestones will help you tackle digital analytics within your organization, uncover the business value it offers, and continue evolving your capability. Every company may initially start with a simple, basic implemenation of web analytics. Eventually most organizations realize they need to tailor the reports to their specific needs (e.g., a retailer needs to have ecommerce metrics, not traffic data). Graduall, companies can evolve their measurement practices over time until digital analytics merges or morphs into customer analytics. When you’re first starting with web analytics, you may be content to know how many visits and visitors you have to your site, where the visitors are coming from, and which pages are most popular. With very little implementation effort—just inserting the analytics tag on your web pages and a few simple report settings—you’re able to receive a baseline of useful and interesting information on your web properties. Many individuals and small businesses start at this stage because it is easy to get up and running with a free or low-cost tool. If your digital initiatives aren’t that strategic to your organization then you might never progress beyond these standard reports. While these standard, generic reports may satisfy your periodic curiosity, most people discover they can’t answer deeper or even fundamental questions about their specific websites because the measurement isn’t tied to their unique business goals or objectives. Although you’ll have a better appreciation of traffic sources, general content consumption, and basic visitor attributes, you won’t have a clear picture of how successful your website really is, which makes improving your online performance more akin to guesswork than science. After some initial forays with web analytics, most organizations recognize the need to have their analytics reports aligned with their business strategies. For example, a retailer needs ecommerce metrics such as orders, revenue, and average order value—not just traffic metrics. The successful organization goes beyond the standard reports and default metrics that are available out-of-the-box and measure aspects that are unique to its particular digital strategy, online business model, and industry vertical. Custom reports and metrics provide deeper, more targeted insights into key visitor activities such as engagement metrics and conversions. Tailoring reports to your specific business needs will require more planning, implementation work, and maintenance, but the payoff is significantly greater. The richer information will provide a clearer, more granular lens for understanding visitor behaviors and improving your overall digital performance. When your digital measurement efforts are closely tied to your unique business goals, you’ll find custom reporting becomes an iterative process where you repeatedly refine what’s measured over time. First, your digital measurement will need to stay aligned and updated to match your company’s shifting business priorities, objectives, and targets. Second, similar to a gold mine, once your custom reports have been sufficiently mined and stop yielding as many new insights, a new mine shaft or set of custom reports may need to be tapped to discover the next gold deposit. You may find that your existing reports can answer business questions only up to a certain point before additional implementation work is required to provide more granular reporting and answer deeper questions. After customizing your reports, you may discover the need to integrate data from other sources to obtain even richer insights. For many businesses, web analytics captures only part of the customer journey or story. What precedes or follows an online session may be just as important as or even more crucial than the observed online activity. All kinds of valuable data often resides in other marketing and backend systems that if connected with your web data could enrich your understanding of your visitors and what drives overall success—not just digital success. In some cases, pre-built integrations make it fairly straightforward to merge data from other sources with your online data. For proprietary backend systems, the integration path may not be as easy or seamless; however, the rewards could be even greater in terms of what competitive advantages it affords your company. For example, knowing that an expensive, hotly contested marketing channel generates a lot of online leads but very few closed sales (data from your CRM system) will enable you to target more effective but less competitive channels that your rivals have overlooked or ignored. When your web data is integrated with relevant offline data, it will be more potent and valuable to your organization. At this stage the focus shifts from enriching the data or reports within your web analytics tool to how your digital data can be used throughout your organization in more innovative and automated ways. Rather than bringing external data into your web analytics tool, you now focus on how your digital data can be fed into other applications and systems to make these solutions even more intelligent, targeted, and effective. While some companies are distracted by massive, all-encompassing Big Data initiatives, a subset of clever, more nimble organizations recognize they already have a wealth of relevant, actionable data within their immediate grasp that can be used to optimize and power their marketing and business operations. In this phase, most of the emphasis transitions from descriptive analytics where you’re analyzing historical performance to predictive and prescriptive analytics in which you anticipate future outcomes and recommend or take an optimal course of action. Analytics-powered solutions are typically reliant on business rules, algorithms, and models to identify and take advantage of the insights hidden within the digital data. This approach opens up opportunities for marketers to target more relevant offers, personalize online experiences, drive re-marketing efforts, inform dynamic pricing, and so on. In some cases, you might be able to leverage existing integrations and in other situations you may need to build hybrid solutions using various technologies. Many organizations reach a point where they need to expand their focus from digital analytics into the area of customer analytics. When companies want to understand how individuals interact with their businesses across multiple channels or touch points, web analytics is limited to just measuring their behaviors and activities within the digital channel as online visitors. With integrated measurement (Stage 3), companies can enrich and complement their online data with a targeted set of strategic external data to obtain deeper insights. However, the perspective remains firmly centered on the digital channel and how it potentially impacts other offline channels. Customer analytics places the individual at the center of analysis irrespective of the channel. It combines the clickstream data with data from such other channels as point-of-sale (POS), call center, and CRM system to create a more complete, holistic view of customers and their cross-channel interactions. User identification within each channel is central to customer analytics so that it can bridge user interactions across channels. Through loyalty programs and other authentication processes, some organizations already have all or most of the necessary pieces to construct a comprehensive view of their users or customers. As the digital channel continues to expand and grow, digital analytics will increasingly converge with customer analytics. However, it should remain a unique and specialized tool that complements and supports customer analytics rather than competing with it. By sharing these maturity levels, the goal is to clarify the key transition points or milestones that your organization will experience or may have already experienced in its digital analytics journey. It’s helpful to know where you currently fall amongst these stages as well as where you might head next. As you experience some wins with digital analytics, it will build momentum within your organization. A hunger for more and deeper insights will emerge and propel your company down the maturity path. If you’re worried about where your organization currently sits in this maturity continuum, don’t forget you need to crawl and walk before you can run. Although you can certainly skip forward to the latter stages, each organization needs to gain experience, expertise, and trust through the initial measurement stages. In addition, integrating other data sources or pushing data into other systems will make little business sense if your underlying digital data isn’t properly aligned with your business needs. Evolution is essential to digital analytics success. Determine what you’re currently doing with your digital data, how proficient you are at your current level, and what benefits could be achieved by pushing to the next stage. As you move down the maturity path, you’ll be in a position to reap more and more business value from your digital analytics investment. Simple, generic implementaton. Reliant on out-of-the-box reports and default metrics. Limited insights into online performance. More robust implemenation that is tailored to measure unique business needs. More granular, custom reports provide deeper and sharper insights into online performance. Offline or third-party data is combined with online reports to further enrich digital insights. Provides insights into how digital marekting efforts are impacting offline transactions or interactions. 4. Analytics Powered Solutions Feeding online data into other business sytems to enrich customer interactions Based on digital data, leverages business rules, algorithms, and models to better target and personalize the user experience. Ties insights with programmatic actions in other systems. 5. Customer Analytics Customer insights across multiple channels (not just digital) Digital data is fed into a broader dataset that covers multple customer touch points or channels. Doesn't replace digital analytics but puts it in context of the greater customer experience.